Sweet home Alabama! People often come here for the southern hospitality and diverse economic growth in automotive, aerospace, healthcare, and more. This state is the only state with all the major natural resources to make steel and iron, making it the largest exporter of cast iron and steel beams. It is also home to Birmingham, the South’s top city for income growth, which is also in the top 25 safest cities in Alabama. Out of the 25 safest cities in Alabama, Birmingham is ranked number 22. Just a short commute to the south of Birmingham is Vestavia Hills, which ranked as the safest city according to our rankings. 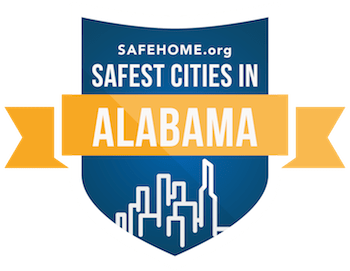 Six cities in Alabama received a safety score of at least 80, with the lowest ranking city, Bessemer, receiving a low 25, about an hour southwest of Birmingham. Vestavia Hills received a superb safety score of 87.25, and a 7.8 percent drop in the already low amount of property crimes. This is an affluent area with a high quality school system. It has been steadily growing in population, becoming the 3rd largest city in Alabama in the past decade. Interestingly enough, the next couple of safest cities in Alabama are just down the road from Vestavia Hills. If you’re wanting to be closer to the Gulf of Mexico, then Daphne would be a great choice for a safe city with easy access to the water and a safety rating over 82. For those wanting to be closer to Tennessee then Florence is your best choice with a safety rating of 70.